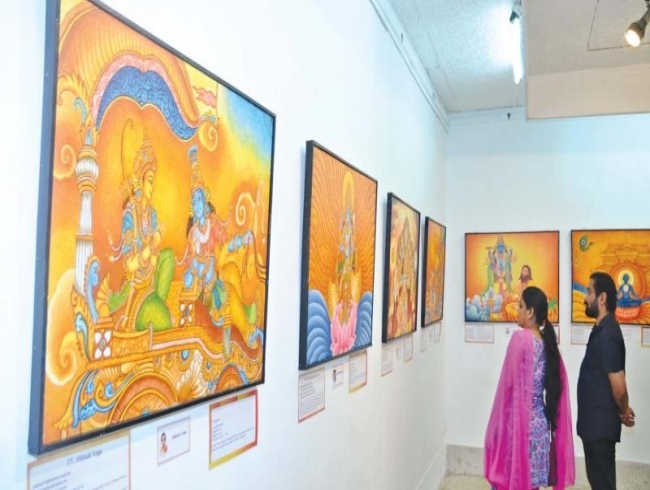 Mural Mahabharatham’, an initiative of Bhagavad Murals, features 113 murals in all. While 112 of them have been painted by women artists, the 113th- a single 7-foot ‘Viswaroopam’ — has been painted in the mural style by Prince Thonnakkal, the guru of Bhagavad Murals. Prince, the man leading the team in a project nearly four years long, is the centre of attention as he walks around describing the paintings with impeccable detail. He and his 35-women-strong army from across the country selected the scenes they wanted to depict four years ago and ensured that important ones were not left out. The process is slow but fulfilling, the artists say. “Master (Prince) drew all the outlines, to ensure uniformity in the storyline. Our artistic freedom was in the details and in the jewellery,” said Mythili Ganesh, one of the 35 artists and one of Prince’s oldest students - of 13 years standing. Murals, as commonly understood, are painted directly onto the walls, especially in places of worship. Here, however, these paintings are all on canvas using acrylic paints. “Earlier indigo was used for the colour blue and a specific stone quarried in Kerala for yellow, but now we have acrylic colours,” says Mythili. However, the artists still stick to the five basic colours of white, yellow, orange, blue and black. All the other colours they require are mixed individually using these colours by the artist themselves. Another drawback of having these murals in paintings would have been the physical strength required. “There will be times when a woman is not allowed in the temple. At the same time, it is difficult to climb scaffoldings and paint,” says Mythili. Prince, therefore, decided to allow his artists to paint these images in the comfort of their own spaces. The idea was not difficult to conceptualise. Master’s wife Sangeetha is also among the 35 women who came together for the exhibition, each with at least three paintings. “He has been crucial in bringing about this change, that women could paint murals too. It is usually all men who make wall art in temples,” she says. Most of the concept came from one of the senior-most members in the group, Usha Rajan, who encourages younger artists to continue pursuing their art regardless of any obstacles. Now, Prince wants to take the exhibition to other metro cities. “We had the exhibition in Thiruvananthapuram first and decided to come to Chennai as a majority of our artists are from here. However, the response we got here was much more than we expected. We have now decided to go to cities like Coimbatore and Bangalore but are looking for sponsors,” Mythili says. “Transportation of the murals is a big cost, but we want the younger generation to understand the cultural heritage and arts,” Prince says.